Disobedient Sheep is a frantic and lighthearted sheep herd'em'up for two to four players. Play as adorable sheepdogs and guide your hapless flock to victory in four different game-modes by avoiding anvils, dodging dynamite, and bailing on boulders. This is a small, unique game. Ideal for short-sessions, young children, rowdy friends, older folks and non-gamers. The game has an over-the-top cartoony style, and because the controls are simple --- the only input is a single analogue stick --- two players share a controller. At events this goes down particularly well with younger children (8 -- 14) and their (often non-gamer) parents. Sheep flock and herd realistically, following models based on acamdeic research and tweaked for game-feel. Herding sheep in real-life is exhausting, difficult, and sometimes hilarious. Inspired by afternoons teaching overexcited primary-school children how to work together to corral a group of flighty sheep, disobedient sheep aims to recreate this chaos without the muddy field. Four unique game modes, in co-op and versus. Take control of four adorable doggos. SicklyDove is a tiny, spare-time indie game studio by Laurie James, server progammer at Big Pixel studios. 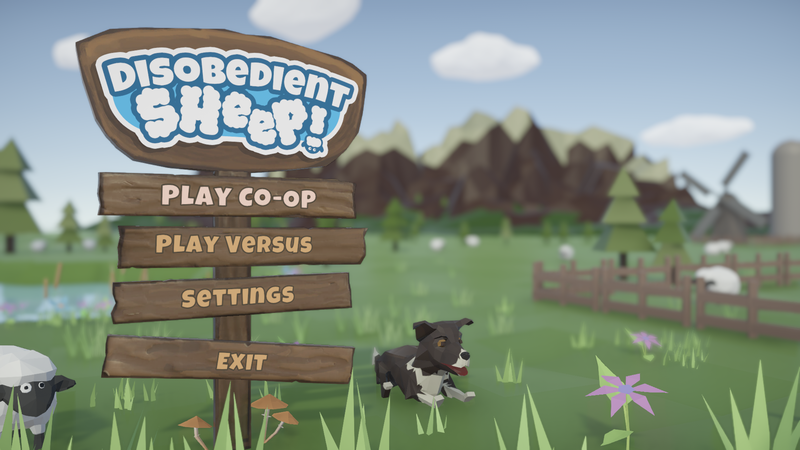 Together with the occasional help of some wonderful freelance-friends, the last two-years have been spent on development of Disobedient Sheep - a sheep-herding party game releasing on Steam Q3 2019. More information on SicklyDove games, our logo & relevant media are available here.